The basic principle of woven and expanded wire in elastomer is based on moulding (encapsulating), either woven wire mesh or expanded mesh into an elastomer sheet. 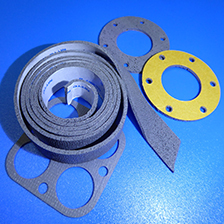 The resultant gasket material in each case has the combined properties of excellent low contact resistance and a high level of environmental sealing afforded by the elastomer carrier. 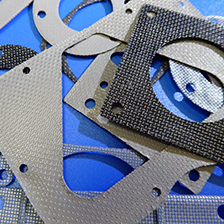 Commonly known as ‘Weaveshield’, this is an effective thin (typically 0.5mm) EMI gasket material comprising of a woven aluminium cloth infilled or ‘over’ moulded with elastomer. 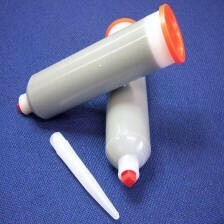 The elastomers used are silicone, fluorosilicone or synthetic type (similar to neoprene). 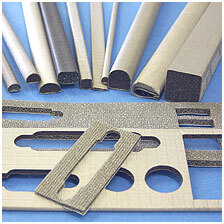 It can provide a watertight or pressure seal where sealing faces have a flatness tolerance of >0.05mm. A high level of EMI shielding performance is reliably achieved by virtue of the array of aluminium mesh contact points exposed at the surface. This material also has the advantage that the woven mesh layer acts as an internal compression limit allowing small cross-sectional area gaskets to be designed in without the requirement for additional mechanical compression stops. Monoshield is similar to the above material with the same elastomer options but instead of incorporating a woven aluminium mesh expanded metal foils are used instead. These expanded metal foils can provide improved contact, and therefore improved shielding performance, along with slightly more compliance than woven aluminium in some applications. 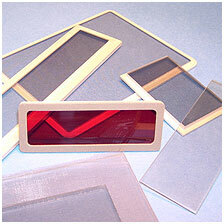 Materials based on monel, aluminium, copper and stainless steel expanded foils are available. The expand foil is available unfilled for use as a gasket material where there is no requirement for environmental sealing.